Part of the Alex Little Hands Series, The Ready, Set, School! 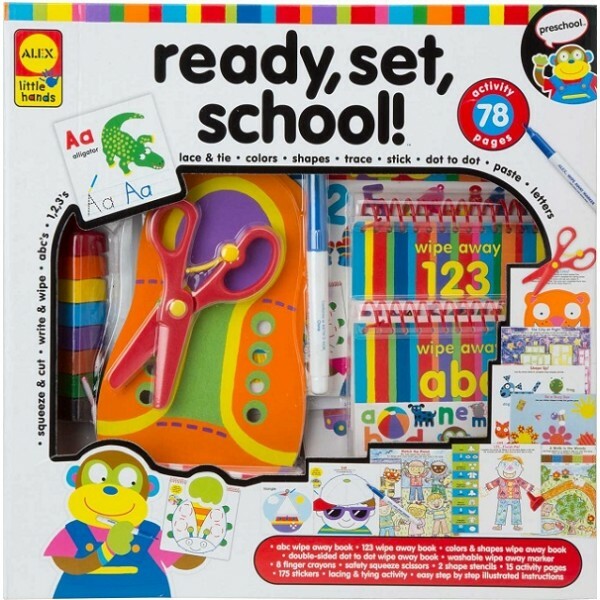 kit is a great way to prepare pre-schoolers for their very first day of school. Children get a kick start on learning the basics: ABC’s, 123’s, colors, shapes, writing, cutting and learning to tie their shoelaces. It’s a hefty kit that includes everything you need to get ready for school. This set includes 3 learning wipe-away books and many other hands-on activities, all in a reusable box with a handle.